Each item is an heirloom to treasure for a lifetime. Jewelry Television® (JTV) President and CEO Timothy B. Matthews will debut his “President’s Collection” of gemstones on June 12 at 10 p.m., EST in a special broadcast of The Vault Show. 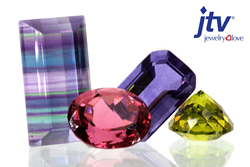 This is JTV’s first collection of gemstones hand-selected by the president and will include over 700 pieces in a wide array of gorgeous colors and prices that bring luxury well within reach. Matthews is highly accomplished in the study of gemstones. He has a fine-tuned eye for precious stones that is evidenced by this collection. Matthews joined JTV as President and CEO in 2008 and decided to further hone his skills in gemology. In less than one year, he obtained the top three diplomas attainable in the gemstone industry: the designations of Graduate Gemologist (GG) from the Gemological Institute of America, Fellow of the Gemmological Association of Great Britain in Gemmology (FGA), and Fellow of the Gemmological Association of Great Britain in Diamonds (DGA). Join JTV for The Vault Show on June 12 at 10 p.m. to watch the premiere of the “President’s Collection” and see the treasures Matthews has hand selected. The full collection can also be viewed at jtv.com/vault. Jewelry Television® (JTV) is the only interactive, multichannel shopping network that focuses exclusively on the sale of jewelry and gemstones. The privately-held company was founded in 1993 and broadcasts high definition programming 24 hours a day, 7 days a week, to more than 80 million unique households in the U.S. Jewelry Television® was recently ranked the 13th largest retailer of jewelry in the U.S. by National Jeweler. JTV.com is the fifth largest jewelry destination on the internet according to Internet Retailer’s Top 500 Guide for 2010. For more information, visit jtv.com.